Are you constantly looking for your chance to save the world? Did you know one of humanity's worst enemies is cow farts and burps? 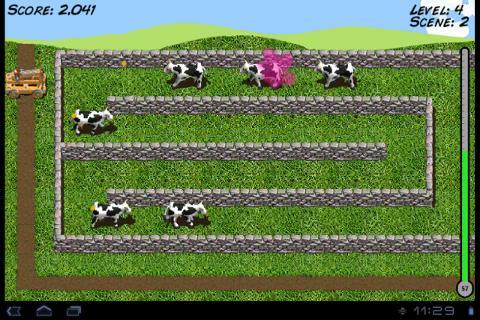 That's right; in Gas Attack, a new game for Android, methane gas from cows damages the atmosphere more than cars! You've got this though. You can save the world and have fun at the same time. The object is simple. You are in a field full of cows and tasked with shooting corks into both ends in order to stop the fumes. Once both ends are plugged the cows burst, and all you have to do is get them all to bust before the temperature rises too high. If you do that, you advance to the next round. Each round is more difficult with the cows increasing in speed and erratic movements. If saving the world and advancing is not enough, you can play to advance in the Swarm supported leaderboards. Compare your score and compete against friends, enemies, and strangers alike. 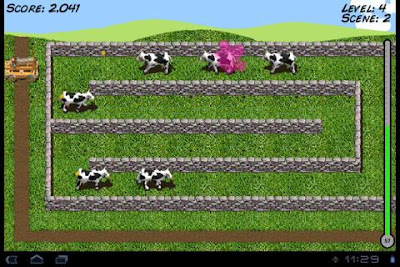 You can plug those cows and get the top score. All you need is practice. Practice shooting corks wherever you are. Do it in line, at home, and even before bed. You may want to keep your comments to yourself and turn the sound down though. Thankfully, no one has invented smell-o-vision yet.